“I’ll fix it in post!” If you’ve been around a movie set, particularly an indie film set, you’ve likely heard this phrase used. When you’re dealing with time limitations, missing props, or haven’t had the time to set the scene properly, the easy answer is to use those 5 simple words. We’d be lying if we said we’ve never used that phrase ourselves. Even after learning the hard way that those 5 words are evil, we’ve still found ourselves using them from time to time. Usually when we say it we think some simple color corrections, maybe a little bit of compositing in After Effects to change the lighting or add elements, will be something easy to do. We reason it out that it’s not really a hard fix with what different video programs are capable of these days. In almost all cases, thinking about the steps it will take to change it later in editing sounds like the simplest thing in the world. That is until you get the footage into the editor and realize that you were dead wrong. 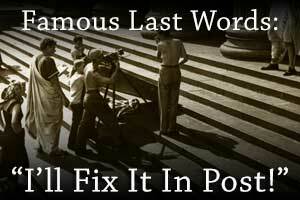 If there’s one thing we learned the hard way, fixing it in post is the absolute last thing you ever want to do. Something that may take an extra 15-30 minutes to set up on set can take several hours when you get to post. Maybe the composites don’t align quite right, or the tracking of the item doesn’t quite track as well as you expected it to. Even worse, trying to match up the lighting and shades when compositing can turn what you thought was a 5 minute job into something 1000x longer to achieve. The thing with fixing it in post is that in most cases it will not look quite as natural as it does when captured in camera. Nothing ever does, and while an audience may not notice it, as a video editor who cares about their work and is paying attention, chances are the slightest thing that’s off you will notice. It will drive you nuts, and you’ll spend even longer trying to get it just right. Whether it’s adding an item as a composite, changing the colors, effecting the lighting, or any number of other things you’d want to fix in post, you have to realize that there are several other aspects of what you shot that relate to the change. These are things that may not be directly related to what you’re planning on doing, but they play a role indirectly. As an example, let’s say you’re missing a tea cup for a shoot that you were planning on placing on a table. You might think adding it in post will be quick and easy. You just have to photoshop a tea cup, load it into the video, and then add tracking for any camera movement so it stays locked to a spot on the table. It sounds like an easy work around, especially with how well programs can track movements these days and the ease of use of photoshop. So what could go wrong? Well there’s a good chance that in thinking about how easy it will be to add, you fail to consider having a nice point of contrast to track the video from. Now you’re stuck having to go frame by frame through the video to make sure the tea cup looks like it’s stable on the table. What about coloring? If it’s on a table cloth it’s picking up that reflection of light. If the table cloth is blue, you have to consider the blue shades in the shadows of light on the bottom of the tea cup. How is the camera moving? Obviously depending on how far the camera moves you’d be seeing the cup from a different angle and a still photo isn’t going to look quite right without seeing that change of perspective. That’s not even taking into account the depth of field, and the focus on the tea cup. That can be difficult to recreate in a natural way depending on how much of a focus there will be on the tea cup during a scene. And if the camera moves forward or backward, or the depth of field changes, well that’s gotta be taken into account to. As we said, not everyone will notice this kind of stuff and the detail that goes into it. When you’re editing it though, and that’s specifically what you’re working on, you will notice it. Your eyes will naturally start focusing on it when you’re watching it over and over, and you’ll see how out of place it can look. Chances are, if anyone else notices it, they’ll start focusing on it continuously whenever they see it too which takes away from the overall value of your work and takes them away from the work you produced. If you think about all those things that can go wrong, and how simple the post fix sounded when you first started, you’ll understand how many hours can be spent just trying to fix something in post. Something as simple as running to the store to grab a tea cup and returning to the set after 30 minutes has now turned into a few hour ordeal. That’s time you could be spending on another project. Add in a few more of those “I’ll fix it in post” moments and you could be talking about adding another 2-3 days or even weeks to your project. So next time you hear yourself saying “I’ll fix it in post,” take a moment to really think about how long it would take to get it right in camera vs how long it could take to get it right later on. I can almost guarantee that in 95% of the cases you’ll save yourself a massive headache by getting it right in the here and now, than trying to get it right later on.